Dutch manufacturer Vanmoof had this problem and solved it by creating a reality distortion field for the delivery guys. 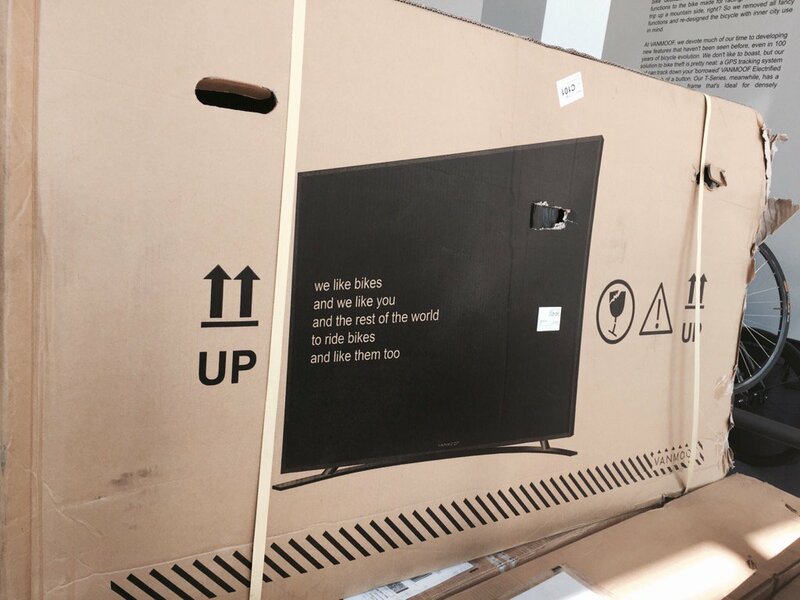 You see, the boxes are about the same size as a high-end TV which did arrive in one piece…so they just solved their shipping problem by printing a picture of a TV on the side. Done! ?Ingenious solution if you ask me. It actually reminds me of a story Frank told me about the start of Hot-Orange, basically an early Amazon competitor which is no longer around. They started shipping products in very bright orange boxes which looked cool, but also tipped off anyone to the contents. Since Hot-Orange sold mostly expensive high-end items often the packages went missing or were opened. This was before the times of tracking-and-tracing which made it even harder to solve. How did they finally fix this? The awesome orange boxes were packed inside a normal brownish box to hide the content… Gone marketing advantage of a cool box but at least the customer received the package!